Before Christmas I wrote about Apple/EMI putting together a small box set containing four of the most popular of the new stereo remasters. I decided as it was a variation in an officially produced box that it’d be worth having in the collection. I found a place in the UK on Ebay that was selling them for a reasonable price (quite a bit cheaper than my local record shops) and so I got one. Who knows, maybe one day it might become a collectable because these were only produced in limited numbers as I understand it. 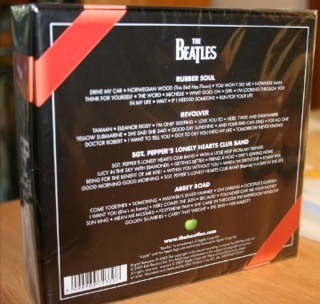 I can’t show you the CD’s inside because I’m going to keep this one sealed. Well, the other day I was in the city and called in to one of the best independent record shops going around – Red Eye Records. They’re great and stock a wide variety of hard-to-get music from around the world. If they haven’t got it they’ll search for you and order it in too. Anyway, while there I saw that they had quite a few copies of what at first appeared to be this same box set up on the shelves behind the counter. Just out of curiosity (I guess to confirm that I’d got a good deal!) I asked what the price was. The assistant said “Those? Oh, they’re just empty boxes. 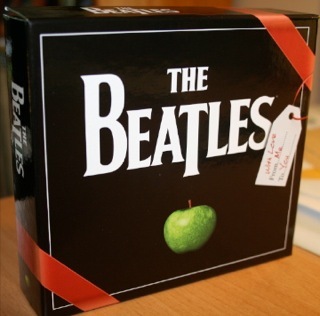 The record company gave them to us to give to people who bought a few Beatles stereo remasters as something to put them in as gifts. We’ve got a lot of them left over. 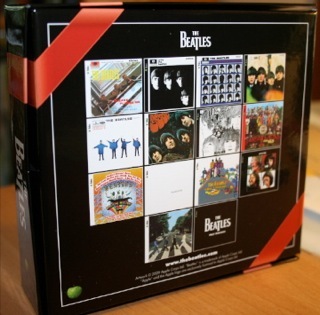 You can have one if you want.” I thought, well one might be handy to have in case any other remasters come my way, or it could store any Beatles CDs really. All the cover images for the entire remasters series are shown. So, a genuine little gift box that can be used for multiples of any of the new re-issue series. And another collectors item? 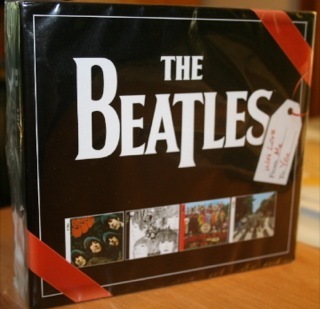 This entry was posted in Beatles, Beatles Collecting, Beatles Music, Beatles Related, George Harrison, John Lennon, Paul McCartney, Rare Beatles, Ringo Starr, Stereo Remasters and tagged Beatles, Beatles Christmas Pack, Beatles Collecting, Beatles Related, Beatles Remastered, Free Giveaway, George Harrison, John Lennon, Music, Paul McCartney, Rare Beatles, Ringo Starr, Stereo Remasters by beatlesblogger. Bookmark the permalink.